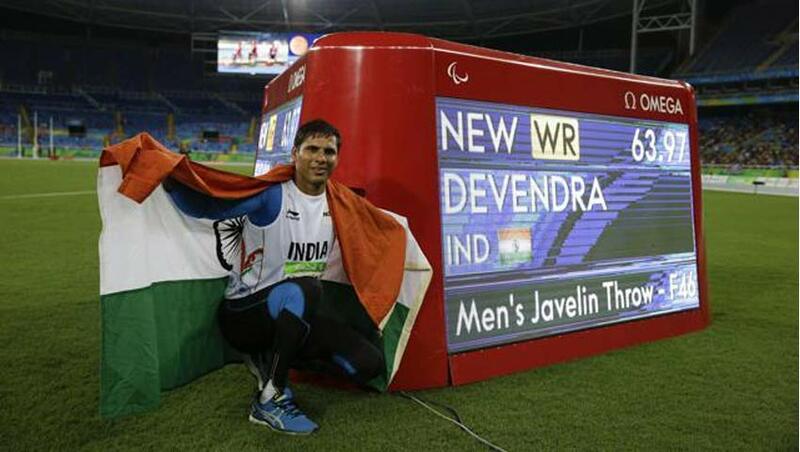 Devendra Jhaiharia is the First Indian, who got second Gold medal at the Paralympics in F-46 Javelin throw. He made an immediate joy and proud for all Indians after the Mariyappan Thangavelu’s Gold. Devendra Jhajharia had already a Paralympic Gold in 2004 Athens Games. In 2004, 36-year-old Devendra Jhaiharia has made a record as 62.15 metres. And now, in 2016, he beats his won record by an attempt of 63.97 metres here on Tuesday (Sep. 13) at the Olympic Stadium (Engenhao). Rinku Hooda and Sundar Singh Gurjar are the two Indian competitors for Devendra Jhaiharia. Rinku Hooda filled his best as 54.39 metres in six attempts and he now stands at the fifth position. Sundar Singh Gurjar didn’t begin his event on Tuesday. Also, it is Fourth Gold Medal for India in Paralympic Games. In 1972, Murlikant Petkar won Gold medal in swimming, In 2004 & 2016, Devendra Jhajharia won Gold Medal in Javelin and another Gold Medal by Thangavelu in High Jump. So, as of now, India had Four medals in its List. Mariyappan Thangavelu and Devendra Jhaiharia’s Two Golds, Deepa Malik’s Silver, and Varun Singh Bhat’s Bronze. Totally Four Rio Paralympics 2016 Medals for India. Devendra Jhaiharia can’t able to place in the 2008 and the 2012 editions. Because those two editions had not the F46 event. He played his Paralympics 12 years ago. Also, he won Gold Medal at the International Paralympic Committee’s (IPC) Athletics World Championships in Lyon in 2013. On this Tuesday, the Britain sportspersons have also created records for their Country at the Rio Paralympics. Georgie Hermitage added 400m gold to her 100m title as she stormed to T37 victory in a new world mark of 1.00.43. At his age Eight, he was injured by the electric shock while climbing a three and he his left hand had to be cut off by surgical operation. Even though, he succeeds his dreams as twice by this Tuesday (Sep 13). The Important Twitter congratulations for Devendra Jhaiharia is provided here below. The PM Narendra Modi, Former Indian Cricket Opener Virender Sehwag, Political Leaders as M Venkaiah Naidu, Mamata Banerjee, Cricket/Sports statistician Mohandas Menon are all congratulating Devendra Jhaiharia. Congratulations to @DevJhajharia on his historic performance at the #Paralympics. His performance will inspire the rural youth. Devendra Jhajharia also had the Two Indian honorable Awards. In 2004, the Indian Government gave Arjuna Award under the category of Athletics. And in 2012, he got fourth highest civilian award “Padma Shri” Award from Indian Government.